Teddy and His Patches were from San Jose, CA. They took their name from singer Teddy Flores Jnr. who wore an eye patch as he had lost an eye to cancer as a child. They were part of a local music scene that included such garage luminaries as The Chocolate Watchband, The Count Five, and The Orphan Egg. Teddy and His Patches played everything from high school dances to opening slots for bands such as The Doors and Moby Grape, and they toured across California. Their first single was recorded by Grady O’Neil at TIKI Studios for his Chance label and was released in February 1967. As drummer Steve Marley later recalled, the a-side was recorded live in the studio on a four track Ampex without overdubs, in just three or four takes. 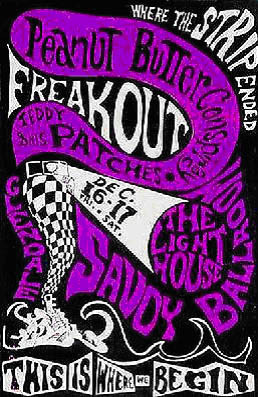 The psychedelic whoops heard on the track were part of the live recording, with Teddy moving from a studio mic to a hand held PA mic that was plugged into an old Fender tape-loop echo feeding back through a PA monitor. The record received considerable airplay in California. Male voice: This is the voice of your conscience baby – uh, I just want to check one thing out with you, you don’t mind, do ya? Male voice: Suzy Creamcheese, honey, what’s got into ya? Suzy Creamcheese was a semi-mythical character, originally based on Suzy Zeiger who had been in the The Mothers’ retinue and later moved to England (where for a while she was the girlfriend of counter-culture mover and shaker John ”Hoppy” Hopkins). After the introduction, pounding drums and organ take over, followed by an instrumental section of pure psychedelic delirium, before the song ends in more reflective fashion – all in all, an absolute monster of acid punk. ‘From Day to Day’ is a more straightforward but catchy garage stomper. In addition to the two singles released at the time, several more songs were recorded for an album but the group broke up before that could see the light of day. Unfortunately those recordings appear to be long lost. Ah, what a joy it would be to hear them of course! Reissues: the a-side is on Big Beat’s Uptight Tonight CD (along with many other compilations), and the flip on Sixties Rebellion Volume 6 or Victims of Circumstances Volume 2. This entry was posted in Classic Singles and tagged Chance Records, From Day to Day, Garage music, Mothers Of Invention, Psychedelia, Psychedelic music, San Jose, Suzy Creamcheese, Teddy and His Patches. Bookmark the permalink.